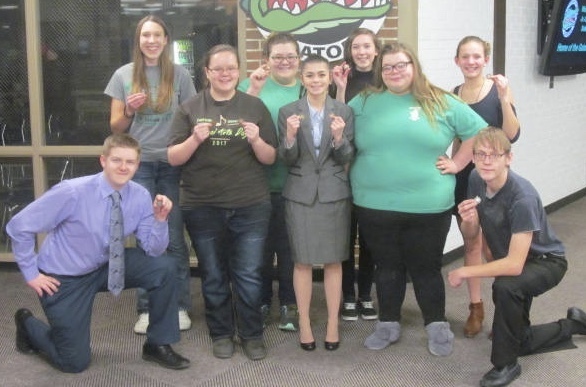 Despite not fielding a complete team, the Wisner-Pilger Gator speech team earned eleven medals overall as they scrapped to a third place finish at the 18-team North Bend Central Invitational Saturday. Two juniors led the Gator efforts--Veronica Peck claimed W-P's sole gold medal with a first place effort in informative speaking while also taking third in poetry interpretation, while classmate Grace Steinmeyer earned third place bronze in extemporaneous speaking while also taking sixth in informative. The Gators had two other varsity runner-up placings as Brett Andersen earned second place in entertainment speaking and Jessica Svoboda took silver in informative, giving the Gators a 1-2-6 finish in that event. Other varsity finalists included Alecia Keller, fourth in entertainment and Jaden Berlin, sixth in poetry. "With our JV basketball team members absent, I thought we'd have to settle for individual honors," said Gregg Moeller, W-P speech coach along with Kasey Alexander and student teacher Kristin Jindra. "But the kids really performed well, and we just missed taking the runner-up trophy." Howells-Dodge earned team honors, followed by host North Bend Central, Wisner-Pilger and Elkhorn out of the eighteen-school field. In novice competition, James Kinnison made the most of his very first final by taking runner-up honors in humorous prose, while teammate Anjelina Frederic placed fourth in poetry and Audrey Glaubius earned sixth in serious prose. "I was excited and pleased to see the novice performers do so well, and to get much needed experience," Moeller noted. The Gator speech team travels to Bancroft Saturday to compete in the Panthers' home invitational. "We'll be rough due to the lack of practice due to the weather, but so will everyone else," Moeller said. "Bancroft-Rosalie's tournament is always a good challenge for us, so we better be ready."